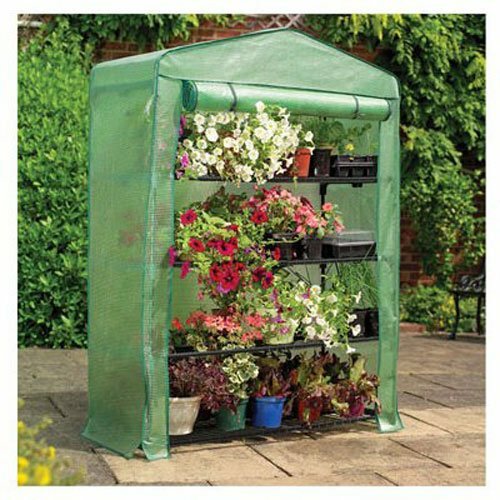 Gardman 7600 Extra Wide 4-Tier Mini Greenhouse. Give your seeds, seedlings, and young plants an early start in this roomy greenhouse. Quality construction and materials to last many seasons. Features a heavy duty reinforced polyethylene cover and roll-up zippered door for easy access. Strong powder-coated tubular steel frame with simple push-fit assembly that requires no tools. Compact size is ideal especially for small backyards or homes where space is an issue. Includes guy ropes, and metal stakes for extra stability against high winds. Easy to follow assembly instructions. Dimensions: 18" Long x 47" Wide x 63" High . Gardman "Bring your garden to life"